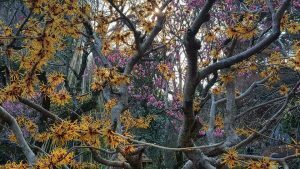 This lovely, private, flowering tree and floral garden is atop a very steep hill not too far from Takahato Fudo temple in the Tokyo -Hino area. 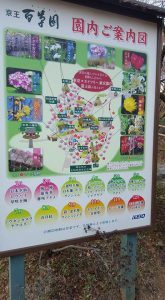 It is an inexpensive 40 min drive from Yokota and not to be missed if you are a flower lover like me! 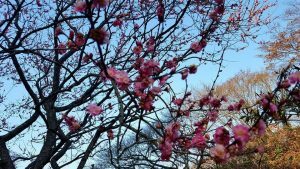 In late February through early March they have a plum blossom festival which just means the private garden is open to all visitors with a small charge of 300¥ for adults and 100¥ for children, when the trees are blooming in all their pink, white, and yellow glory! The garden features 500 plum trees in 50 varieties! We visited on a late Saturday afternoon, Feb 24, 2018 and it was only slightly busy. Besides the stalwart walkers, there were several groups arriving by taxi up the steep hill coming from nearby Mogusaen station. It’s 1/4 mile up a 20% grade slope to give you an idea of the steepness for those with elderly or mobility impaired visitors. The gardens were absolutely gorgeous! There were some flowering plum trees that I’d never seen before! There was one field even featuring small yellow and white daffodils in full bloom as far as the eye could see! I am a flowering bulb enthusiast and seeing daffodils in February made my heart happy! Unfortunately I could only find a Japanese language webpage but the photos and map on one of the page links were helpful. There is NO parking at the gardens but if you’re lucky you can find places along the street going up to the gardens or in pay parking lots at the bottom of the hill. Note: It is about a 5 minute steep walk up a paved hill to the gardens from parking. Below is information from their website’s lavender link and it’s in English! Traffic Get off at Keioi Jusugyoen Station 10 minutes on foot or 10 minutes by taxi from Sacred Sakuragaoka Station · Takahata Fudo Station. 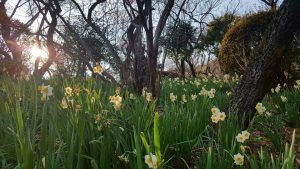 There is a steep slope partway from Hakusakuen Station to this garden. This entry was posted in Daytrips, Sports & Outdoors, Spring, Uncategorized. Bookmark the permalink.